On February 5, VIX levels had their largest single-day spike in the history of the index1. While VIX levels quickly reverted to prior low levels, the event piqued investor concern. And rightly so. After years of exceedingly low VIX levels—and possibly investor complacency—higher values seem more likely moving forward. In this post, we will use regime-based investment risk analytics to demonstrate how analyzing fund performance in various market regimes can improve the typical manager screening process for both short-term (tactical) and long-term (strategic) portfolio allocations. It is well known that equity returns are closely (and negatively) related to their volatility, as illustrated in the chart below, which uses CBOE VIX levels as a proxy for volatility. Here we plot a universe of 318 Large Cap Blend mutual funds and ETFs over the past 10 years. The volatility regimes isolate separate time periods where the CBOE VIX monthly average is within manually selected ranges of low, moderate and high volatility. A notable change in market environment, like increased volatility, is a common trigger for evaluating, or reevaluating, fund suitability within a portfolio. Typical manager screens2 often focus on historical risk-adjusted performance over a weighted combination of trailing time frames. But they seldom explore the path and patterns within historical returns that can be an important source of insight. Adding a dimension based on behavior in economic regimes can mitigate the sensitivity to arbitrary time periods and isolate characteristics that are desirable in economically relevant time periods. To offer an example of this approach, we apply two screening approaches to a US Large Cap Blend peer group: a typical manager screening approach and a volatility regime-based approach. The typical screening approach selects the funds with the highest returns and Sharpe ratios, with the most volatile funds across the full 10-year period filtered out. The historical regime-based approach selects top-performing funds based on return and volatility stability across all three VIX regimes, which means it filters out funds that demonstrate the least stable volatility in each individual regime. The funds selected by each screen are highlighted in the chart below in the same regime-based risk/return charts as seen above. The typical screen selects 20 funds (indicated in orange), the regime-based screen selects 28 (indicated in blue), and there are 11 funds (indicated in red) that are identified by both screens. These 11 funds we consider to be the result of a typical search “enhanced” by regime awareness. To extend this example, if we expect volatility to rise in the future but are operating without strong conviction, we can choose to isolate managers in the regime-based screen that have performed comparatively well in all selected regimes. If we, however, have strong conviction regarding future market volatility, we can apply more weight to specific historic regimes, which would deliver different combined results. To consider the differences between the funds identified by both the typical and regime-based enhanced screen, let’s move on to a more granular analysis. Below we select two funds with nearly identical risk and return profiles over the entire period. The first fund (Fund A) was captured solely by the typical screen, while the second fund (Fund B) was captured by both the typical screen and what we will now call the regime enhanced screen. Fund A and Fund B are both quite close to a reference benchmark, the iShares Russell 1000 ETF. They outperform slightly over the past 10 years with nearly identical volatility. While there are funds with more significant outperformance under both screens, this illustration is clearer when the overall risk and return of the selected funds are the same. Now let’s look at how each fund delivered its 10-year return in more granular detail. In the chart below, which shows the cumulative excess return of each fund through different volatility regimes, we can see that Fund B followed a much smoother path than Fund A. Furthermore, in the excess return chart below (vs the iShares Russell 100 ETF reference), we see that Fund A has significantly outperformed in low volatility regimes and underperformed in high volatility regimes. Fund B shows a markedly different pattern, outperforming during high volatility regimes and underperforming during moderate volatility regimes. If this pattern were to hold, it could be considered a hedge against market turbulence, while giving up little in less volatile periods. Volatility, itself, in all regimes is nearly identical, with the exception of Fund A showing higher volatility during low volatility regimes. 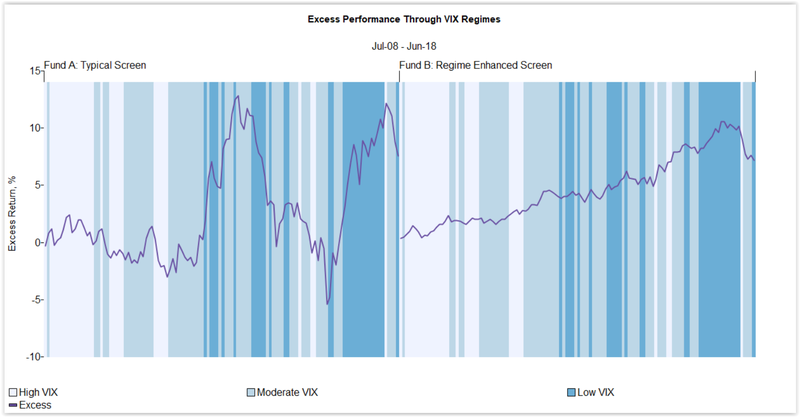 We can also extend this analysis beyond a regime enhanced screen to view how individual funds respond to changes in VIX or theoretical shocks to other market indices or economic factors. We will address this topic further in a subsequent post. Fund selection isn’t a one-size-fits-all process, and there are many considerations beyond volatility regimes that can and should be used. There are clear benefits, however, to adding regime analysis to a manager screening process. If an investor is selecting managers for tactical, shorter-term purposes, they may wish to place more weight on specific regimes that are thought to be most likely to occur in the near term, such as higher (or lower) volatility. If they are more interested in selecting funds for a strategic portfolio, without strong conviction on regime direction, they may opt for a screening system that identifies funds that will, ideally, be stable through all the inevitable climates that portfolios will experience longer-term.